Just recently, I was on a tour and I took the Trans-Asia Shipping Lines ferry Asia Philippines on the way home by plan. I strove to sail with her since I want to compare her with her sister ship, the Danica Joy 2 of Aleson Shipping Lines of Zamboanga which is probably sadly gone now since she was no longer salvaged after she capsized in Zamboanga port due to a mistake in the unloading of the ship almost exactly a year ago on September 2016 (she is now gone from Zamboanga port having lain there on her side for some time). In the comparison I found that the Danica Joy 2 had the superior accommodations and better amenities between the two. Asia Philippines is no better than the sold-now former Asia Indonesia which formerly plied the Cebu-Masbate route for Trans-Asia Shipping Lines. The two are basic overnight ferries for maybe just the purpose of having sleeping accommodations while sailing and their early 1990’s refittings are clearly evident. There is an air-conditioned Tourist section alright plus a Cabin by the bridge deck in the officers’ cabin row and the usual Economy and a basic kiosk and a restaurant that offers hot food at a high price but nothing much else and there is not even a proper lounge for passengers. I found out that the appointments of the Danica Joy 2 are a little better. There are Cabins and the Tourist is larger and with more room to walk around plus there is a lounge and I got the feeling that with a limited space Danica Joy 2 tries to make the passengers more comfortable as its route to Sandakan is longer that it can also qualify as a liner route as it is more than an overnight route. The canteen is also better and hot food can be ordered also plus there is a separate restaurant for the crew in the aft of the navigation deck. What is more it is female attendants that attend to the canteen. The two ships have the same origins as both are former vessels of the Shikoku Ferry in Japan which links Shikoku island with Japan’s largest island of Honshu. The Asia Philippines was the Orange Star in Japan while the Danica Joy 2 was the Orange Hope. 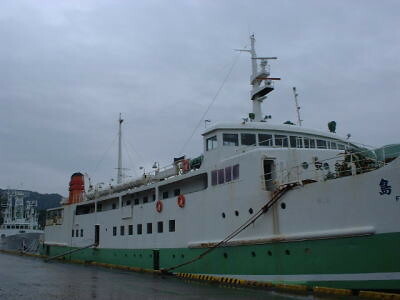 The Orange Star was built by Nakamura Zosen in their Matsue yard in Japan in 1975. Her keel was laid in November 1974 (thus her IMO Number is 7434262) and she was completed in April 1975. She is a RORO ship with bow and stern ramps and a single car deck between the ramps. The Length Over-all (LOA) of the ship is 67.2 meters and the Length Between Perpendiculars (LBP or LPP) is 60.3 meters with a Beam or Breadth of 14.2 meters which means she is wider than most ferries of that length. Originally, the ship’s Gross Register Tonnage (GRT) was 997 tons with a Deadweight Tonnage (DWT) of 413 tons. Of course, the hull material of the ship is steel alloy and she has 2 masts and two funnels at the top signifying she has two engines which are two sturdy Daihatsu marine engines of 2,000 horsepower each for a total of 4,000 horsepower which is better than most of the ships this size at the approximate period the ship was built. As such the design speed was 15.5 knots which was better than most for ferries of this size built in the mid-1970’s. Incidentally, she was the last ship built by Nakamura Zosen in the Matsue yard (the Danica Joy 2 was built by Nakamura Zosen in their Yanai yard in 1982). The Asia Philippines came to the country in 1994 when Trans-Asia Shipping Lines Inc. (TASLI) was acquiring a lot of RORO vessels and expanding and has already disposed of their old cruiser vessels (the company was among the regionals which was early in shifting to ROROs from cruisers). The Orange Star was the replacement of an earlier cruiser Asia Philippines of the company which was sold to Cokaliong Shipping Lines Inc. (CSLI) which became their Tandag, the first steel ferry of the company (now who can believe that just over 20 years ago such is the disparity of the two companies that Cokaliong was just buying cast-offs of Trans-Asia then when now they are already the leading company?). The first route of the new Asia Philippines was the Cebu-Cagayan de Oro route in tandem with the beautiful and bigger Trans-Asia (1), the best overnight ship then from Cebu to Northern Mindanao. That pairing assignment lasted until 1975 only when the sister ship of Trans-Asia (1), the Asia China arrived and Asia Philippines was then reassigned to the Cebu-Iloilo route of the company. Now, until just recently the Asia Philippines was still doing that route at times, the concrete indication of the lack of progress of Trans-Asia Shipping Lines over the decades when nearly ten years ago the Asia Philippines already had to battle the much-superior Filipinas Cebu of Cokaliong Shipping Lines in the important Cebu-Iloilo route. 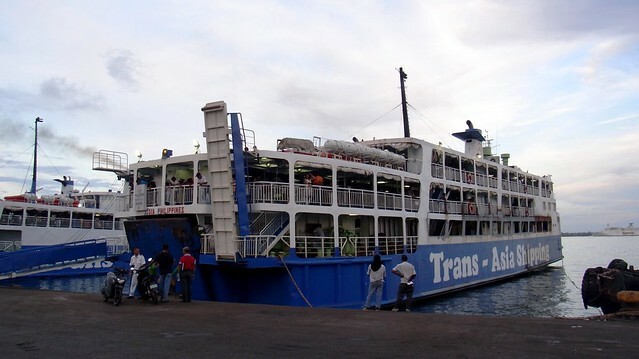 When I rode her, the Asia Philippines is the regular of Trans-Asia Shipping Lines in the Cagayan de Oro-Tagbilaran route, a minor route which she plies with three round trips a week every night with a diversion to Cebu from Tagbilaran once a week. As of now the Asia Philippines is already the lowermost in the totem pole of the Trans-Asia ships because the equally old Trans-Asia 2 is bigger and considered superior to her and holds the more important Cebu-Ozamis route. In size, the Asia Philippines is roughly approximate to the Trans-Asia 8 of the company but the is a newer ship than her with better appointments and speed. The Asia Philippines has only two passenger decks with a small Tourist section in the lower passenger deck ahead of the restaurant which is located at the middle of that deck and behind that is Economy section. The upper deck is an all-Economy accommodation. As mentioned earlier the ship has no lounge and no Cabin either (did I simply not saw it?) and there is just a small front desk at the front of the restaurant on the opposite side of the kiosk. The basic restaurant is air-conditioned and it is beside the mess for the crew and that area is also where they cook the food called the galley in a ship. With a tight space the crew eat standing up or otherwise they bring their meals on styropor boxes elsewhere and usually in the passageway either standing or crouching. Like in other overnight ferries linen is complimentary in the Tourist section and there is none for the Economy class. At first the aircon in the Tourist that not seem strong enough but as the night deepens one will also need the blanket provided free of charge. One very noticeable weak point of the ship is the toilet and bath. It is simply to small for the passenger capacity and at times one has to queue especially in the morning. And there is practically no provision for showering. Near the front desk and the canteen are two sofas which serves as the “lounge” of the ship. Asia Philippines canteen. The ship galley is behind that. The ship is equipped with a side ramp and a gangway on the side. I found out this is what they use in Tagbilaran port when they do side docking. At the stern of the ship is the usual two gangways for the passengers, a facility so that the cargo operations of the ships is unimpeded and this is a necessity since at times the ramp of the ship is over a meter below the wharf apron in low tide. The car ramp of the ship is the usual clipped or shortened type commonly found in Cebu overnight ferries that are better for the Cebu-type of forklift operation. This is so because almost all of the cargo of the ship is loose cargo or palletized and forklifts are used to move those. In Cebu overnight ferries one forklift at the wharf and another forklift at the car deck pass to each other the cargo and the lip of the ramp is just danger to the forklift above especially when wet or muddy. And besides the ship don’t ballast anyway like most Cebu overnight ships and when the tide is low there is no way to deploy the ramp to the wharf and so the ramp just resides at the side of the wharf and the lip will then just be an obstruction and so they just remove it. The problem with clipped ramp happens when a car has to be loaded. It is not too difficult when the ramp can be deployed atop the wharf when the tide is high. The problem arises when the ramp can’t be deployed atop the wharf. That is what happened to us in Cebu. Light vehicles won’t depress much the ramp when the weight of the car is transferred to the ramp but loaded trucks are another matter. Of course the company has already mastered the art of making this difficult loading possible. The Asia Philippines is getting old and obsolescent already for Trans-Asia Shipping Lines. I don’t know if the company is already thinking of disposing her now that TASLI has already a more moneyed owner, the Udenna group of Dennis Uy that also controls now 2GO, the only liner company left in the country. Maybe Udenna will find out now that the amenities of Asia Philippines is already deficient by the standards of today and certainly far from their former Cebu Ferries ships. But then the company will always find out that this lesser ferry still fits their Cagayan de Oro-Tagbilaran route and will even fit their Cebu-Masbate route, a route where the passenger service of Trans-Asia Shipping Lines stopped (but not the cargo service) because they lacked ferries for some time now especially when the beautiful sister ships Trans-Asia (1) and Asia China were sold without replacements. However, if she is retained for a while for service in the minor routes I think it will be be better if her accommodations are improved and 2GO is an old master of such improvements. But should the coming five more ships of Starlite Ferries (a shipping company now also owned by the Udenna group) is diverted to Trans-Asia Shipping Lines then the Asia Philippines will be disposable and not necessarily to the breakers. She is still too good for the broken up and she can be sold to carriers in the eastern seaboard (or maybe to another overnight ferry company in Cebu). My only comment is her engines is a little big for the routes there where speed is not really that much needed there (and even with 4,000 horsepower Asia Philippines can’t seem to get much speed nowadays anyway). I remember that was also the problem of the Trans-Asia Shipping Lines’ Asia Japan with has the same 4,000 horsepower from two Daihatsu engines and of about the same size. Well, with the shorter Cagayan de Oro-Tagbilaran route that lack of speed will not be a problem. But in the Cebu-Masbate route it will be, a little. With the entry of the Udenna group, I really can’t guess the future of Asia Philippines but it might not be the same as the other old ships of the company which is continually run because there are no new ships anyway. And the entry of big Udenna group is good because Trans-Asia Shipping Lines will be injected with new life again, for sure. Wither Asia Philippines? We will see that in the coming days.